I was in my fifties before I tried my first parsnip. They just weren’t a vegetable I grew up with, most likely because my Dad didn’t like them. But when I finally got around to it, the best case scenario presented itself. One of my favorite local growers, Elizabeth Taylor, was cutting them up and passing them out for interested customers to try. Never in my life did I expect something so “plain” looking to taste so good. Now every year I wait for Elizabeth’s parsnips–they are one of the highlights of fresh produce at our Farmer’s Market. Luckily for me, though, there’s usually a regular supply of organic parsnips at the Moscow Food Co-op, which gave me the opportunity to experiment with my own version of Choosing Raw’s Parsnip Rice recipes. Originally I was smitten with Gena’s idea of using it to stuff nori rolls, and I still am. But honestly I never got that far. It tasted so good right out of the bowl of the food processor that instead I dumped it on top of my salad that day, and that’s what I’ve been doing with it ever since. 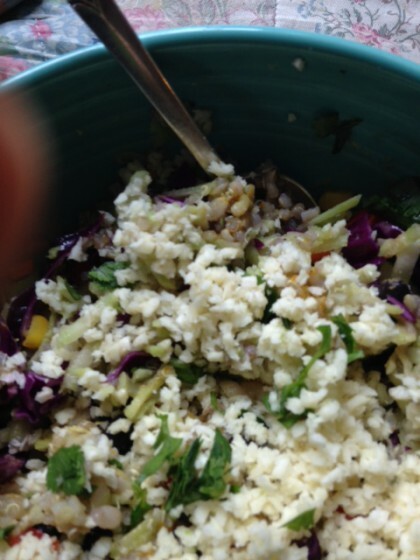 My version is inspired by Gena’s Raw Parsnip Sushi Rice, but I made a few changes. Since I wasn’t making a bunch of sushi, I used two good sized parsnips instead of five. And I took her suggestion that tahini might be a good alternative to almond butter. I used less and left out the oil. And added some lime juice and zest instead of the tamari, and a little sprinkle of ginger. Voila. Place everything in the bowl of your food processor and whir it up until it is parsnip confetti. Spoon it into a bowl and enjoy by itself, or top your favorite salad with it for an extra tasty crunchy kick. Lime Ginger Parsnip Particles will keep nicely in a covered container in the fridge for a few days, ready to pep up a salad or a bowl of noodles, even a taco. Whatever you desire. I called these Parsnip Particles instead of Parsnip Rice for three reasons. The first and most important one to me is that I simply loved the alliteration. The second is that although this wonder of a treatment does resemble rice, I didn’t use it as a substitute for rice in my confetti salad. 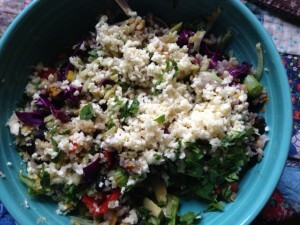 It went on top in addition to the other veggies and the rice, millet, or quinoa already in the salad. Also, because there’s less fat and no oil in my version, I’m not sure it would stick together quite enough to successfully imitate sushi rice. But if one of you tries that option before I do, let me know how it worked. And finally, I’m no physicist, but I did once teach biology majors how to write about chaos theory. I know enough to know I’m not using the science accurately when I say this, but nevertheless Lime Ginger Parsnip Particles remind me of the term strange attractor. It might be because it’s such a long way from an often passed-over and over-cooked stew vegetable to this bright, crunchy tasty raw treatment of it. Yet they come from the same root “system,” the same initial conditions. And though I can be lazy and loathe to get out my food processor, for this unusual taste treat, I do it gladly. I’m betting you might too. Perhaps you’ll invent your own version of Gena’s original or my knock-off of it, spreading infinitely fractal enjoyment of this not-so-insignificant-after-all root vegetable. I raise my spoonful of Lime Ginger Parsnip Particles to the beauty of order in chaos! I love parsnips! This is a great way to use them. I’ve done a cauliflower “rice” but this is a nice addition to that genre. 🙂 Thanks for the recipe! I will definitely try it out on my next salad bowl. Thanks Veronica! I think they have a zest to them that cauliflower rice doesn’t quite have, although it’s okay too. Glad you will try it out! I’m so happy you loved this, Maria! I remember the first time I made the rice; I really wasn’t sure I’d like it (I thought of parsnips as having such a strong taste and tough texture), but it was totally love at first bite. Your version sounds delicious; I will gladly put tahini in and on anything, and the lime zest, I’m sure, gives it a lot of freshness. As for particles vs. rice, I will always celebrate alliteration 🙂 Poetry people, eh?